It is hard to know at what stage you are ready for investors or if you qualify for traditional financing. Three experts Dave Harris, Doug Johnson, and Mike O’Connell will be guiding you through funding 101 for entrepreneurs at startup week. Rockies Venture Club manages an Angel investor chapter in Fort Collins and provides educational content to investors and entrepreneurs in the Fort Collins area. The reason we feel strongly about this community is its highly collaborative and there is a genuine drive to support one another. That makes it unique to a lot of other ecosystems throughout the state and provides a major draw to investors in our group. That is what leads me to Fort Collins consistently from Denver. I really love taking part in this community. From our Pitch Academy and Angel 101 events, I hope everyone gains an understanding of how Angel investors think and what they look for in companies they invest in. Investor psychology is fascinating. Entrepreneurs that can see their business through the lens that Angels do generally present much better and ultimately can build a much stronger business. Our Sharkless Tank event is designed to be the “Anti-Shark Tank” where Angels and VCs will provide constructive feedback and questions to pitch presenters, but will also educate the audience on how actual deals are done. There won’t be any sharky negotiations that end up in worse deal for both parties. It’ll be a lot of fun and it will look much different than any other pitch event. Dive in deep. Not only into the Poudre during the Poudre Plunge, but dive into all of the amazing content and opportunities that FCSW provides. It is electric to be surrounded by so many like-minded people so take advantage of this week as much as possible. I’ve made so many strong relationships from Startup Weeks, but it takes work. 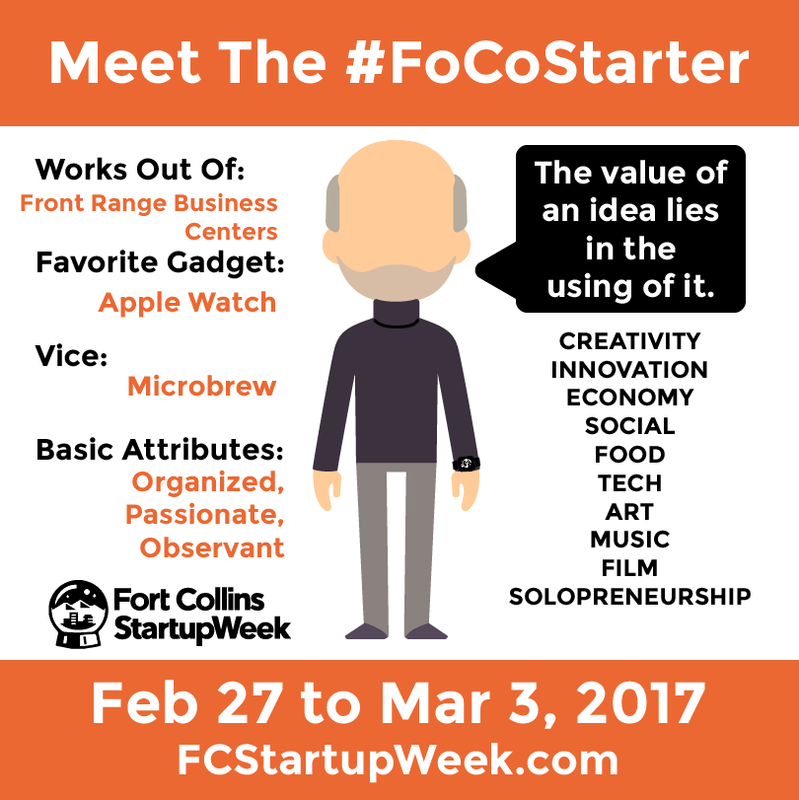 I’d like to connect with more Fort Collins entrepreneurs that are considering venture capital. I’d also like to see more investors get engaged and take the pulse of this awesome community throughout this week. I see Fort Collins continuing to mature over the next 5 years and the rest of the state developing a better understanding of why this community is so special. There will be several more major success stories to come out of this startup community over the next 5 years, and I anticipate that those companies will continue the trend of recycling their success and expertise back into the Fort Collins community. Doug Johnson currently serves as chair for the Colorado TIGER 21 investor group, Senior Advisor to the Impact Finance Center, CO Impact Days and Initiative, chair for the Virtual Board and works with a number of high net worth individuals, families and foundations on direct investment and impact investment strategies. In addition, he is also a board member of The Interfaith Alliance for Colorado and serves on the Regional Development Council for the Community Foundation of Northern Colorado. A wealth advisor by training, Mr. Johnson has worked for Charles Schwab, First Western Trust and Everence and was most recently the Vice President for Access to Capital with Innosphere, Colorado’s premier nonprofit science and technology incubator. A Colorado State University graduate, he makes his home in Fort Collins, CO with his twin sons, Jacob and Dane. I was born and raised in Fort Collins and thankful to still call it home. I’m rooted here with my family including my parents and my twin sons who are sophomores in high school. Funding solutions that are right for their type and stage of business. Be curious. Attend something new and stretch yourself to learn more and meet new people. Satisfaction that the network and experience I’ve gained over the years can be paid forward to help more entrepreneurs. A thriving innovation center of more than half a million known for some great startup wins in the arts, energy, water, technology and community building. Mike O’Connell earned a business degree with a marketing emphasis from Purdue University, and worked in a variety of executive sales, marketing, and business unit management positions, including eleven years with Thermadyne Holdings, North America’s third largest manufacturer of metal cutting and welding equipment. In 2001, O’Connell purchased Mountain Woods Furniture (MWF), a leading national designer/manufacturer of rustic hand-crafted furniture, and co-owned and operated that business until its’ sale in December 2011. MWF’s products were sold through Cabela’s, national furniture e-tailers, furniture stores, and to resorts and lodges desiring a rustic style. He provided over 6,000 paychecks to American manufacturing workers during his ownership of MWF. He is co-chair of the Larimer County Workforce Development Board (WDB). He enjoys spending time with his three children, hiking and exercising, playing guitar, singing, and photography. I was living in St Louis, and negotiating to buy a business. I came to Fort Collins to look at the business, and thought Fort Collins was a really cool place, and decided to go ahead and move here. I closed on the business about 3 months later, that I operated for the next 11 years. I’ve stayed here because the people are great, plus there are many many benefits to living here, with very few negatives. The weather is unbelievably good! Useful real-world information, and an understanding of the resources to help them with their process. We work with about 650 clients a year, and if I could wave a magic wand and fix two things for all of them, it would be: 1) Your business concept needs more focus. Most clients come in with a concept that is a mile wide and an inch deep. We want you to be a hundred yards wide and a half-mile deep. 2) Understanding that the sales process is probably going to be your biggest challenge – everyone wants to talk about the lease, product/service, loan, blah blah, and spends 15 minutes thinking about WHO they are going to sell to and WHY that person would buy the product. What’s your competitive advantage that’s going to persuade someone to give you their money ?? I would like to see the attendees exit FCSW being more street-smart about what really makes a business succeed, and better connected to useful resources. We are going to have some significant new workforce challenges going forward that didn’t exist 20, 10, even 5 years ago. I think the businesses that will “win” will be those who excel at retaining/motivating their team members.